If you just don’t have the time to use the GOBOX Estimator and it hasn’t been a long time since your last move, think about the size of the vehicle you used in your last move. If you used a van in your last move, this is equal to one GOBOX. If you used a 16′ cube truck, this is equal to three GOBOXES. If you used a five ton, 24′ cube truck, this is equal to five or six GOBOXES. If you used a semi-trailer truck, this is equal to ten GOBOXES. If you used a small vehicle and did multiple trips or you moved over five years ago you may need to use the GOBOX Estimator. The NEW GOBOX Estimator is useful if you haven't moved in a long time and for budgeting purposes. The Estimator will give you a clear picture of how big your move really is. The Estimator is easy to use but it does require an investment of time. By using the Estimator, you will have a clear picture of how big your move really is. The Estimator will mentally get you in the mood to move and brings your awareness to all the items that need to be sold, given away, or dumped. The Estimator is useful if you haven’t moved in a while or have substantially increased your possessions. The Estimator is most useful if you need a precise number for budgeting purposes. 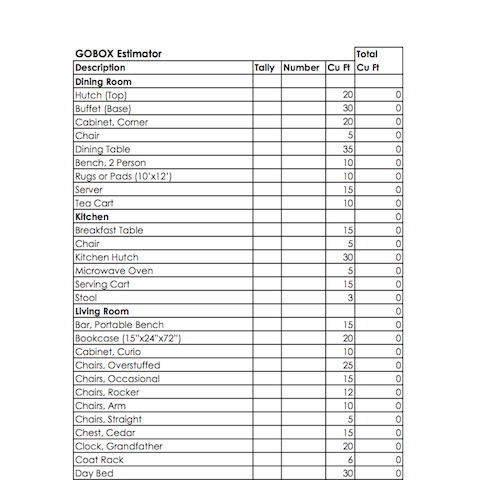 Print off a copy of the GOBOX Estimator.You can find a printable copy of the GOBOX Estimator Worksheet on the Resources page of the website. Use this copy to do your inventory. Start at the front door of the house. Methodically go through each room on the main floor. Then go upstairs, followed by the basement, garage, and any other out buildings. Again, be methodical. Mentally name each room: entry hall, dining room, kitchen, living room, office, etc. Give a tally mark for all of the furniture on your Estimator sheet. Later, add up all the tally marks for a total number of a given item. If you have an unlisted item that’s larger than 5 cubic feet rename a similar sized item from the list. The goal is to have all furniture itemized on your Estimator sheet. After estimating all of the furniture in a room, estimate the cubic feet of the remaining contents. Estimating the contents of a room is hard but you don’t have to do a perfect job. Estimate how many cubic feet it would take to pack all of the remaining stuff in each room. The remaining content of a room is everything minus the furniture. This includes all the stuff in drawers, closets, cabinets and all small items like lamps. If the contents are already in boxes it’s easy. Add up the number of boxes times the size of the box to get the cubic feet. If the content is not boxed -- which is usually the case -- you just have to guess. 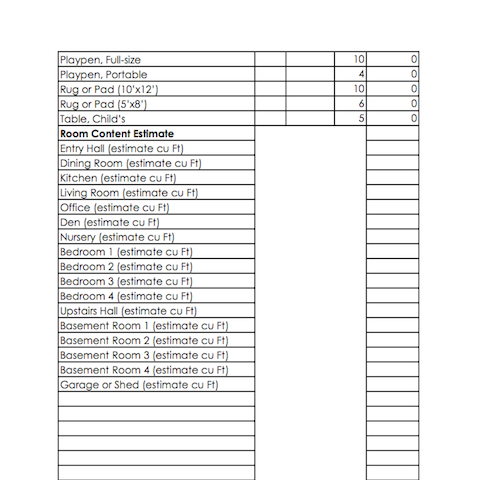 Record each room’s contents separately on the Estimator sheet. When you are done, either manually add up all the contents page by page, or go back to your computer and re-enter all of the information into the GOBOX Estimator on the website.If you prefer, there is an Excel Spreadsheet GOBOX Estimator on the Resources page that works in a similar way to the online GOBOX Estimator. Estimating contents is where many people go wrong. The Estimator will help you to not forget about contents. SOS TIP: Contents should be around 40% of the total furniture volume but it can be anywhere from 20% to 60%. This is a common place for people to underestimate how much stuff they have. SOS TIP: If you get stuck or have problems using the GOBOX Estimator please give us a call at 250.374.4646. We can have our moving and storage expert talk you through the process.